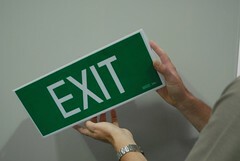 Home » Blogs » rporteous's blog » When is emergency & exit lighting required to be installed in a building? in every room or space to which there is public access in every storey in a Class 6 or 9b building if? in every required fire control centre. door serving as, or forming part of, a required exit in a storey required to be provided with emergency lighting in accordance with E4.2. Maintenance Essentials provides inspection, testing, maintenance and surveys of essential safety measures including emergency lighting and exit signs. For more information speak to a member of our team by calling 1300 30 88 22. Submitted by Anonymous (not verified) on April 21, 2012 - 15:25. "d.in every required non fire-isolated stairway; and"
Anyone know what this means? just a standard strair way? I have a class 2 (3 stories) and this is the only clause that MIGHT be applicable if I knew what it meant.